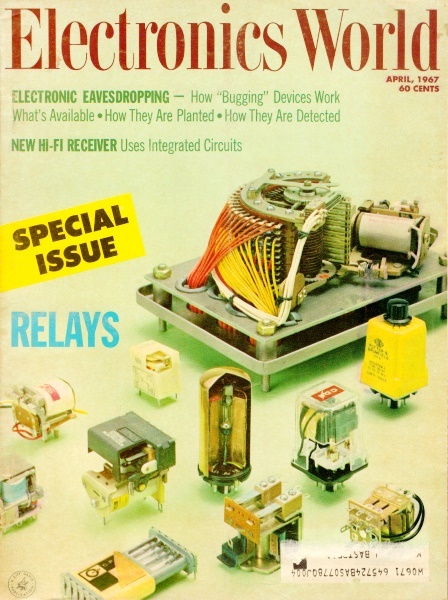 Millimeterwave radar has been around for quite a while, as evidenced by this article in the April 1967 edition of Electronics World. We don't read much about Q-band systems nowadays, but Q-band is used in some familiar contemporary applications like satellite communications, terrestrial microwave communications, automotive radar, and radio astronomy. For radar purposes, the 8-mm (about 1/3 inch) wavelength allows for very fine feature resolution. Stability of the radar platform is the limiting factor in this case. Radar operating at 8-mm wavelength (about 35,000 MHz) is now being used on crowded European waterways. It provides better resolution, will pick up smaller targets and show their shapes. In talking with many users of radar - Coast Guard, commercial, and military - the author found that the emphasis in marine navigational radar is on close capability and performance. In many cases, existing equipment (operating mainly in the 9000-MHz range) sometimes is just not good enough in this regard. 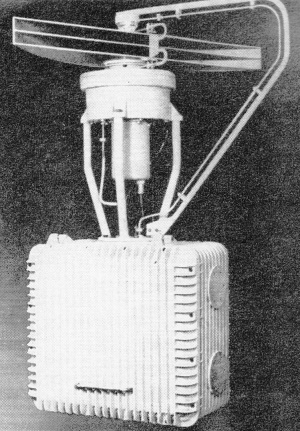 Transmitter-receiver unit and double antenna of Q-band radar. A distance potential of 200 miles or more is necessary in search radar or that used by the U.S. Weather Bureau (the radar used by the Bureau's New York office has a range of 250 miles), but a cargo vessel steaming at 15 to 17 knots on the open sea or 3 to 7 knots in inland waters has little interest in a radar contact on the extreme range of its instrument unless the course and speed of the target vessel can be seen as constituting a converging course with its own. Even then, if the speeds involved are not too great, another bearing and range check will not usually be made for some time. 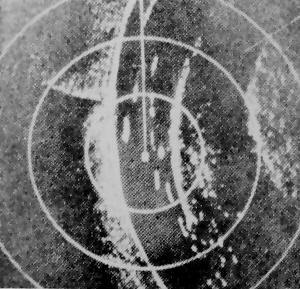 What the captain or pilot of a freighter or tanker is interested in are the near targets, the ones that he might hit or that might hit him. Here, minimum-range capability, high bearing resolution, and high range resolution are essential. 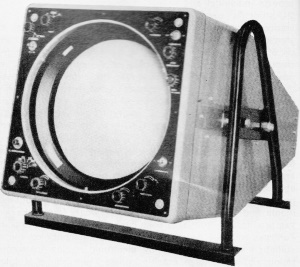 Indicator unit of the Philips marine radar uses a 12-in CRT. These three factors become more and more important as the ship progresses from port area to port proper and are vital when the vessel enters certain inland waters where channel width and congestion are considerations. There is increasing need for radar which will have better range and bearing resolution, pick up smaller targets, have faster picture recovery, and actually present the shape of the target on the viewing screen as well as be capable of much closer work than heretofore possible. Radar display produced on equipment installed in vessel traveling along the Rhine. The vessel's position is at the dot at the center of the inner range ring. These rings are about 1000 feet apart. The river banks, which are about 500 feet from the vessel, as well as other ships can be clearly discerned. Same display taken about 6 minutes later. All these requirements are said to be found in the new 8-millimeter wavelength radar (approximately 35,000 MHz) now coming into use on narrow, crowded European rivers such as the Rhine where traffic sometimes reaches a count of 35 vessels per kilometer. This 8-millimeter or Q-band radar, in its upward excursion in frequency, has gained many advantages for navigational radar. [Actually, there are two frequency bands involved in millimeter-band radar. One of these, 34,500 to 35,200 MHz (nominally 8 mm ), is in use in Europe, and the other, 31,800 to 33,400 MHz (nominally 9 mm) is not permitted in Europe]. First, Q-band radar has increased small-target recovery, higher frequency waves are more readily reflected by smaller targets. Second, since high bearing discrimination or resolution is a function of antenna beam width, and beam width in turn is a function of antenna size, it becomes possible for small antennas to have very narrow beam widths at these frequencies. This physically smaller antenna, also being lighter, can be given a higher rate of rotation (typically 40 rpm in Q-band use) which leads naturally to better close-range capability and faster picture recovery. Unfortunately, there was a bad side effect resulting from small-target advantage gained by using higher frequencies. Since smaller targets are reflected much better at 8- and 9-millimeter wavelengths, the interference from rain and drizzle is also increased. This was a major problem with Q-band radar. A radar which is inoperative during drizzle and rain cannot be classified as a useful navigational instrument. This rain- and sea-clutter interference problem, according to one maker (Phillips), is now solved by a refinement of the basic r.f. sensitivity time-control circuit used in radar equipment for suppression of clutter. With marine commerce becoming ever more sensitive to "man-hour" figures, the need to keep cargo vessels (especially in port and inland water use) moving in all sorts of weather is assuming vital importance. The ability of a radar to allow the master or pilot of a ship to thread a narrow, constricted, and usually well-traveled waterway is probably the most important factor in judging a radar's usefulness. This capability seems to be quite high with Q-band radar. Possibly the most significant contribution to marine navigation offered by Q-band radar is in very quick determination of any change of course of the target vessel. With optical observation, the changing silhouette of the ship will immediately tell the captain that the vessel is altering course. 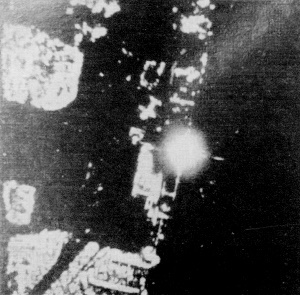 On centimeter radar, the target ship must progress a certain distance along the new course before the radar operator can detect that such a change has in actuality been made. In some cases, 8-millimeter radar will make a course change apparent even before it is possible by visual observation because the actual outline of the ship is presented on the display screen. The swing of the target vessel is seen in an instant, and for this reason 8-millimeter radar is often used in clear-weather navigation. Among captains and pilots of commercial craft on inland waters and harbors, the true yardstick of a radar's performance is its minimum-range capability. With millimeter radar's ability to "see" as closely as 35 to 40 feet, with its better delineation of small targets, and with its high range and bearing discrimination, close-in navigation in sticky situations is no longer the nerve-wracking job it once was. The only factor preventing quick acceptance in America is its price, and the fact that the only major manufacturer (to come to the author's attention) is a European concern. The Philips 8GR260 marine radar shown in the photos is transistorized (with the exception of the magnetron, video output tube, klystron, and CRT). It has a peak power output of 20,000 watts on 35,000 MHz, with a pulse length of only 0.04 µsec. This unit uses the "double-cheese" type of antenna (0.6° horizontal beam width by 17° vertical) since a duplexer and T/R units for the frequencies involved are too expensive and prone to failure. This small antenna has solved one difficulty associated with harbor-monitor radar which is mounted in many instances on lighthouses. 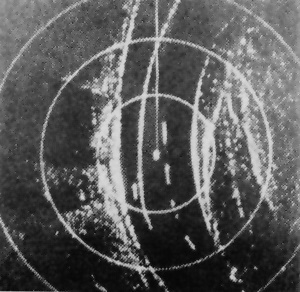 The larger cross-section presented to the wind of centimeter radar often sets up a vibration in the optical system of the light and makes it impossible to maintain focus. The small cross-section of a millimeter radar antenna makes it especially well adapted to this service. Another view of the airport but taken at somewhat reduced range. Above and to left of the bright dot, you can see a large plane near maintenance hangar. Radar display shows small portion of an airport. 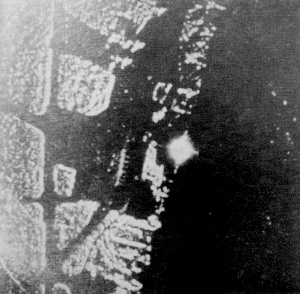 Runways are clearly visible and, if you look to the left of the bright dot near the center of the display, you can see a small aircraft moving along the ground.